National Novel Writing Month has inspired numerous month-long creative challenges, one of which is National Solo Album Month. 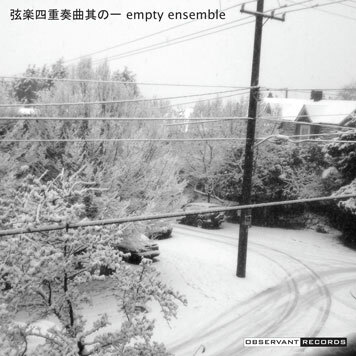 Eponymous 4 participated in that challenge back in 2006 with an album of solo piano pieces. Pretty much, they were knock-offs of Eluvium and Michael Nyman, though many ventured into Philip Glass territory. One piece went so far as to quote Sigur Rós. 弦楽四重奏曲其の一 (“Gengaku Shijuusou Kyoku Sono Ichi”, or “String Quartet Songs, Vol. 1”) are string quartet arrangements of some of those pieces from that National Solo Album Month challenge.